DNA methylation ensures genome integrity and regulates gene expression indiverse eukaryotes. In Arabidopsis, methylation occurs in threesequence contexts: CG, CHG and CHH. The initial establishment of DNAmethylation at all three sequence contexts occurs through a process known asRNA-directed DNA methylation (RdDM), in which small RNAs bound by Argonaute4(AGO4) guide DNA methylation at homologous loci through the de novomethyltransferase DRM2. Once established, DNA methylation at each of thethree sequence contexts is maintained through different mechanisms. Althoughsome players involved in RdDM and maintenance methylation have beenidentified, the underlying molecular mechanisms are not fully understood. Toaid the comprehensive identification of players in DNA methylation, wegenerated a transgenic reporter system that permits genetic and chemicalgenetic screens in Arabidopsis. A dual 35S promoter (d35S) driven luciferase (LUC)reporter was introduced into Arabidopsis and LUCL, a linewith a low basal level of luciferase activity, was obtained. 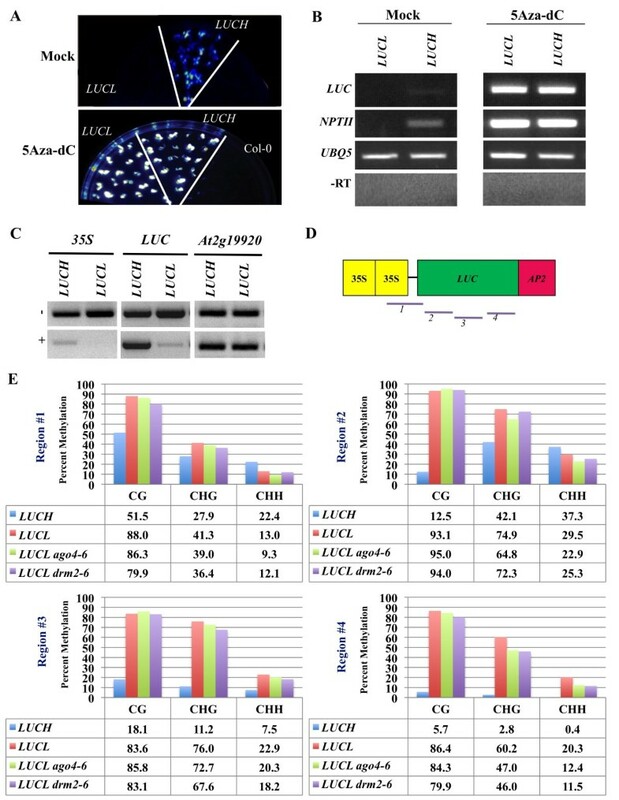 LUCLwas found to be a multi-copy, single-insertion transgene that containsmethylated cytosines in CG, CHG and CHH contexts, with the highestmethylation in the CG context. Methylation was present throughout thepromoter and LUC coding region. Treatment with an inhibitor ofcytosine methylation de-repressed luciferase activity. A mutation inMET1, which encodes the CG maintenance methyltransferase,drastically reduced CG methylation and de-repressed LUC expression.Mutations in AGO4 and DRM2 also de-repressed LUCexpression, albeit to a smaller extent than loss of MET1. 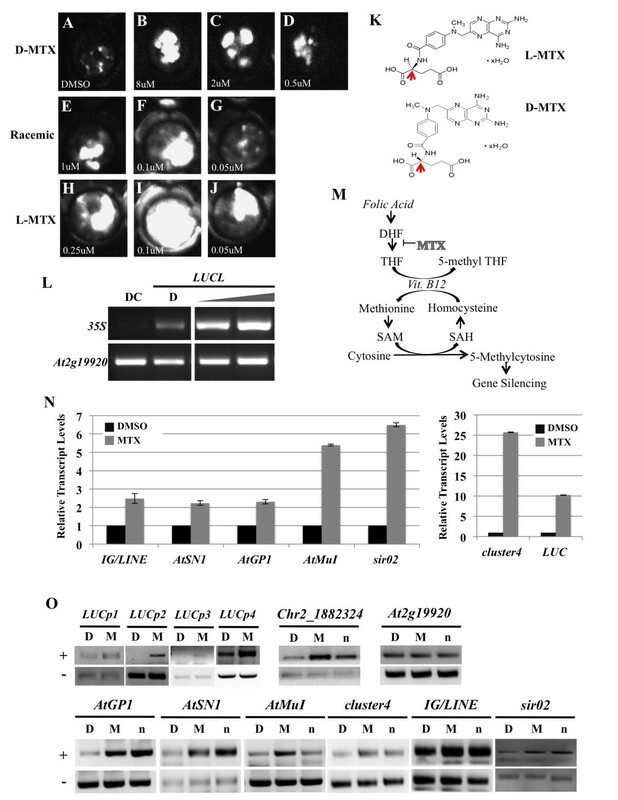 UsingLUCL as a reporter line, we performed a chemical screen forcompounds that de-repress LUC expression, and identified achemical, methotrexate, known to be involved in biogenesis of the methyldonor. We developed a luciferase-based reporter system, LUCL, which reportsboth RdDM and CG maintenance methylation in Arabidopsis. The lowbasal level of LUCL expression provides an easy readout in geneticand chemical genetic screens that will dissect the mechanisms of RdDM andmethylation maintenance. An epigenetic modification that influences gene expression and genome stability iscytosine DNA methylation, which involves the addition of a methyl group to the fiveposition of the pyrimidine cytosine. This mark in transposable elements orintergenic regions is often associated with transcriptional gene silencing (TGS) andcontributes to genome stability. In Arabidopsis, de novomethylation is guided by small and long noncoding RNAs and is referred to asRNA-directed DNA methylation (RdDM). The RdDM pathway can be divided into three maincomponents. First, in an unknown manner, RNA polymerase IV (Pol IV) is recruited totarget loci and generates single-stranded RNA (ssRNA). Second, the ssRNA is madedouble-stranded by RNA-Dependent RNA Polymerase 2, and the double-stranded RNA isfurther processed into 24 nucleotide (nt) siRNAs by DICER-LIKE 3. One strand isloaded into Argonaute4 (AGO4), the major effector protein of 24 nt siRNAs. Third, inparallel, RNA polymerase V (Pol V) is also recruited to these loci by an unknownmechanism and generates long noncoding transcripts. It has been proposed that thesetranscripts act as a scaffold for the recruitment of the siRNA-AGO4 complex. Thisfurther facilitates the recruitment of other downstream effectors such as InvolvedIn De Novo 2 and the de novo methyltransferase DRM2 to methylatethese loci (reviewed in ). Although many genes in this pathway have been identified, keyoutstanding questions on the underlying molecular mechanisms of RdDM remain to beanswered. In Arabidopsis, there are three types of cytosine methylation: CG, CHG andCHH. CG and CHG are considered symmetric methylation, whereas CHH methylation isconsidered asymmetric methylation. The three types of DNA methylation are allestablished by RdDM, but are maintained via different mechanisms after DNAreplication. CHH methylation is maintained by constant de novo methylationby DRM2 and other players in the RdDM pathway. CHG methylation is maintained by areinforced loop between the DNA methyltransferase Chromomethylase3 and histonemodifications (reviewed in ). CG methylation is maintained by DNA Methyltransferase 1 (MET1) andintriguingly, MET1 has been shown to also be required for full levels of denovo methylation of CG dinucleotides . The players involved in CG maintenance methylation are conserved between mammals andplants. Specifically, in mammals, newly replicated DNA is hemi-methylated and DNMT1,the MET1 ortholog in mammals, is responsible for methylating the newly synthesizedstrand . DNMT1 is recruited to newly replicated DNA through interactions withUHRF1 and PCNA. UHRF1 specifically binds to hemi-methylated CG dinucleotides [4–7], and PCNA is present at the replication fork . In Arabidopsis, CG maintenance methylation is mediated byMET1 and three Variant In Methylation genes (VIM1-3), whichare orthologs of UHRF1 [9, 10]. Like in mammals, the recruitment of VIM1 to hemi-methylated DNAfacilitates the recruitment of MET1, which results in the methylation of thedaughter strand. In addition, CG maintenance methylation in Arabidopsisalso requires Deficient In DNA Methylation 1 (DDM1), a chromatinremodeling protein [11, 12]. CG methylation is located not only at transposable elements/intergenic regions, butalso in gene bodies. About one-third of genes have CG methylation in their codingregions in Arabidopsis (this number is higher in mammals), and gene body CGmethylation is also maintained by MET1. CG methylation in gene bodies does not cause silencing, unlikemethylation at transposons . In fact, genes harboring body methylation are moderately to highlyexpressed [14–16]. The purpose of CG body methylation is still unclear; however, hypotheseson its potential functions include the suppression of cryptic promoters withincoding regions [14, 17] and the enhancement of accurate splicing [18, 19]. Here, we describe the generation of a luciferase (LUC)-based reporter linethat enables screening for genes involved in CG maintenance methylation as well asCHH methylation via RdDM in Arabidopsis. Due to the extensive CGmethylation in the LUC coding region, the reporter may also help tounderstand the functions of gene body methylation. This line is named LuciferaseHarboring CG Methylation, Low (LUCL) for its high levels of CGmethylation and low levels of LUC expression. Consistent with the findingthat LUCL harbors high levels of CG methylation, the met1-3mutation resulted in a release of DNA methylation at the transgene promoter andthroughout the LUC coding region and drastic de-repression of LUCexpression. Interestingly, introducing ago4-6 and drm2-6 mutationsinto LUCL also resulted in the de-repression in LUC expression,thus LUCL also reports de novo methylation through RdDM, althoughRdDM contributes to the silencing of LUCL to a much lesser extent than CGmaintenance methylation. The near complete silencing of LUC expression inLUCL means facile screens can identify genetic mutations or compoundsthat release LUC silencing. The performance of a chemical genetics screenwith LUCL led to several hit compounds. One of the hit compounds wasmethotrexate (MTX), which is known to indirectly prevent the production ofS-adenosyl methionine (SAM), the methyl donor . Treatment of plants with MTX resulted in reduced DNA methylation at, andde-repression of, six endogenous RdDM loci that were examined. Therefore,LUCL could serve as a great tool to probe the mechanisms of DNAmethylation. Luciferase-based reporters have been used extensively as probes for differentbiological processes [21–24]. Initially, we aimed to develop a luciferase-based transgene thatreports miRNA activity. For this purpose, we generated a transgene in which theLuciferase (LUC) coding region fused to a portion of theAPETALA2 (AP2) gene that contains the miR172 binding site  was behind a dual 35S promoter from the cauliflowermosaic virus (Figure 1A). In the sametransfer DNA, dual 35S-driven Neomycin Phosphotransferase II(d35S::NPTII) served as a selectable marker for planttransformation (Figure 1A). The transgene wasintroduced into the RNA-dependent RNA polymerase6-11 (rdr6-11)mutant background to prevent post-transcriptional gene silencing [25–27]. We established two independent Arabidopsis lines containingthis transgene, LUCH and LUCL (Luciferase Harboring CG Methylation,Low), the latter being the topic of this study. Although the transgene inLUCL and LUCH is identical in sequence, LUCL hasa much lower level of luciferase activity than LUCH (Figure 1B). In fact, the luciferase activity in LUCL waspractically non-existent and comparable to that of the wild type (Col-0)(Figure 1B). LUCL is a multi-copy, single-insertion transgene. (A) LUCL as a multi-copy transgene. Only two tandemcopies are shown, with each copy extending from RB (right border of thetransfer DNA) to LB (left border of the transfer DNA). Restriction sitesand distances between sites are noted. The question mark indicates theunknown distance between two tandemly arrayed copies. The stars indicatethe miR172 binding sites. The red lines depict the region used as aprobe in the Southern blots in (C) and (D). (B)Luciferase luminescence from LUCL and LUCH seedlings.Ten-day-old seedlings grown on the same plate were imaged for luciferaseluminescence using a CCD camera. The blue spots in the LUCHsector represent seedlings with luciferase luminescence. The lack ofsignals in the LUCL sectors represents the absence ofluciferase luminescence. (C) Southern blot analysis ofLUCL, Col-0 and LUCH. The gray triangle indicatesincreasing amounts of genomic DNA from LUCH; the left lane hasan amount of DNA equal to LUCL whereas the right lane containstwice that of LUCL. Genomic DNA was digested withEcoRI and hybridized with a probe corresponding to theLUC coding region (red line in (A)). The 2.1-kb bandcorresponding to the LUC-AP2 fragment is indicated by a redarrow. The intensity of the 2.1-kb band in LUCL is much higherthan that in LUCH. (D) Southern blot analysis ofLUCL and Col-0. Genomic DNA was digested withBamHI and hybridized to a probe corresponding to theLUC coding region (red line in (A)). Theapproximately 6-kb band (red arrow) represents the possibility of amulti-copy transgene as the distance between the two BamHIsites in two tandemly arrayed copies is 5.4 kb (not counting theunknown distance between the LB and RB (question mark)). We first characterized the nature of the transgene insertion in LUCL incomparison to LUCH. LUCH was shown to contain a single-copytransgene at a defined genomic location . For LUCL, the segregation pattern of kanamycin resistance(conferred by d35S::NPTII) was consistent with the transgene beinginserted into a single genomic locus. However, unlike for LUCH,multiple attempts to identify the insertion site in LUCL via thermalasymmetric interlaced PCR (TAIL-PCR) failed. This suggested that multiple copiesof the transgene may be tandemly or inversely arrayed at the insertion site. Totest this hypothesis, we performed Southern blot analyses on LUCL andLUCH using the LUC coding region as a probe. Genomic DNAfrom LUCL and LUCH was digested with EcoRI, whichshould release the LUC-AP2 portion of the transgene (Figure 1A). The band corresponding to the 2.1-kb LUC-AP2portion was more intense in LUCL than in LUCH when the sameamount of DNA was used (Figure 1C). The intensity ofthe band was higher than that of LUCH even when the amount ofLUCH DNA was twice the amount of LUCL DNA(Figure 1C). Moreover, when LUCL genomicDNA was digested with BamHI, which has a single site in the transgene(Figure 1A), a band of approximately 6 kbwas observed (Figure 1D, arrow). The size of thisband is consistent with that of a BamHI fragment from two neighboring,tandemly arrayed transgenes (Figure 1A and 1D). Thus, LUCL is a multi-copy, single-insertiontransgene. LUCH does not report miRNA activity even though it contains the miR172binding site . We wanted to know whether LUCL, which was derived from thesame transgene in an independent transformation event, is repressed by miR172.If LUCL is repressed by miR172, then mutations causing reduced miR172accumulation are expected to cause the de-repression of LUCL. Thedcl1-7 allele is a partial loss-of-function mutation inDICER-LIKE1 (DCL1), a key factor in miRNA biogenesis [28–31]. We crossed dcl1-7 with LUCL and observedluciferase luminescence in eight different F2 populations (Additional file1: Figure S1 and data not shown). No seedlings inany of the F2 populations (Additional file 1: FigureS1) showed enhanced luciferase luminescence. We genotyped some of the seedlingsand were able to identify dcl1-7 homozygous ones. As the F2 seedlingswere selected for kanamycin resistance, all contained the LUCLtransgene, although it was not known whether they were hemizygous or homozygousfor the transgene. These results suggested that LUCL does not reportmiRNA activity. Since LUCL is not repressed by miRNA activity, we tested whether it isrepressed by DNA methylation. We grew LUCH and LUCL seedlingsin a medium containing 5-aza-2′-deoxycytidine, a chemical inhibitor of DNAmethyltransferase activity . LUCL and LUCH seedlings treated with5-aza-2′-deoxycytidine had higher levels of luciferase luminescence thanmock-treated seedlings (Figure 2A). More importantly,the two lines had nearly equal levels of luciferase luminescence in the presenceof 5-aza-2′-deoxycytidine (Figure 2A),suggesting that the lack of observable luciferase activity from LUCLwas likely due to DNA methylation. To confirm that the observed increase inluciferase activity was due to an increase in transgene expression, we performedreverse transcription-PCR (RT-PCR) on the seedlings, as shown inFigure 2A. The expression of the LUCtransgene as well as the nearby NPTII transgene was lower inLUCL than in LUCH in mock-treated seedlings(Figure 2B). The expression of both transgeneswas de-repressed by treatment with 5-aza-2′-deoxycytidine(Figure 2B). LUCL is silenced by DNA methylation. (A) Effects of5-aza-2′-deoxycytidine (5-aza-dC) treatment on LUCH andLUCL. Ten-day-old seedlings grown on plates with or without5-aza-2′-dC were imaged for luciferase luminescence using a CCDcamera. Col-0 was included as the negative control. Each blue or whitespot represents a seedling. Under the same imaging conditions,5-aza-dC-treated LUCL and LUCH seedlings had muchhigher levels of luciferase luminescence compared to mock (DMSO)-treatedseedlings. (B) RT-PCR of mock-treated and5-aza-2′-dC-treated LUCL and LUCH seedlings in(A). The LUC and NPTII genes are shown.UBQ5 served as an internal loading control.‘–RT’ indicates RT-PCR conducted in the absence ofreverse transcriptase during the reverse transcription step. (C)Detection of DNA methylation in LUCH and LUCL by McrBCdigestion of genomic DNA followed by PCR. The + gels are DNAtreated with McrBC. The − gels are DNA treated in thesame manner as the + gels except that no McrBC was added.At2g19920 was used as an unmethylated internal control. (D) The d35S::LUC-AP2 transgene in bothLUCH and LUCL. The four lines below the rectanglesmark the four regions interrogated by bisulfite sequencing in(E). (E) Detection of DNA methylation at the luciferasereporter gene in LUCH, LUCL, LUCL ago4-6 andLUCL drm2-6 by bisulfite sequencing. The graphs representthe percentage of DNA methylation (y-axis) at the three differentcytosine contexts (x-axis). The percentage of DNA methylation is alsolisted in the tables below the graphs. See Additional file 1: Table S2 for bisulfite conversion rates.5-aza-dC: 5-aza-2′-deoxycytidine; RT-PCR: reversetranscription-PCR. DMSO: Dimethyl sulfoxide; McrBC PCR: digestion ofgenomic DNA by McrBC followed by PCR. As the experiments above suggested that LUCL was repressed by DNAmethylation, we set out to determine the levels and sequence contexts of DNAmethylation as well as its distribution along the transgene in LUCL. Wefirst examined the methylation status of LUCL by digesting genomic DNAwith the restriction endonuclease McrBC followed by PCR amplification of theDNA. McrBC cuts methylated DNA in the presence of GTP  such that the presence of PCR products indicates lack of DNAmethylation. Upon digestion of LUCL and LUCH DNA with McrBC,we found that little PCR products were observed at the 35S region ineither line (Figure 2C). This is consistent with ourprevious observation that the d35S is methylated in LUCH. The lack of PCR products in LUCL suggested that thed35S in LUCL also harbors DNA methylation. In addition,the LUC coding region was also methylated in LUCL, whereas itis not in LUCH (Figure 2C). Therefore,LUCH and LUCL both harbor 35S promotermethylation and LUCL also contains coding region methylation. We nextdetermined the sequence contexts in which LUCL is methylated. Weperformed bisulfite sequencing of LUCL and LUCH at fourregions covering the promoter and the coding region (fragments 1 to 4 inFigure 2D). Specifically, fragment 1 was from thed35S upstream of the LUC transgene (instead of thed35S upstream of NPTII) and contained 100 bp of theLUC coding region, and the other three fragments were from theLUC coding region (Figure 2D). We foundthat LUCL harbored higher levels of CG and CHG methylation and lowerlevels of CHH methylation at the d35S region relative to LUCH(Figure 2E, Region 1). In fact, LUCLexhibited high levels of CG and CHG methylation throughout the LUCcoding region, whereas in LUCH, DNA methylation was restricted to thepromoter and the 5′ portion of the coding region (Figure 2E, Regions 2 to 4). CG maintenance methylation requires MET1 – loss-of-functionmutations in MET1 result in global hypomethylation [2, 34]. Since LUCL harbors high levels of CG methylation, we wantedto see whether the methylation as well as the TGS status at LUCLrequires MET1. We crossed LUCL into met1-3 and foundthat luciferase luminescence was extremely high in LUCL met1-3 plants(Figure 3A). This was accompanied by a drasticincrease in LUC transcript levels as determined by RT-PCR(Figure 3B). We examined the DNA methylationstatus in LUCL met1-3 by bisulfite sequencing analyses at thed35S promoter and the LUC coding region. We found thatthat CG methylation was dramatically reduced in LUCL met1-3 plantsthroughout the four regions (Figure 3C). CHHmethylation was barely affected and CHG methylation was only slightly affected(Figure 3C). Taken together, the high levels ofCG methylation in the promoter and gene body of LUCL are maintained byMET1, and loss of CG methylation results in strong LUCexpression. met1-3 releases DNA methylationin LUCL . (A) Luciferase luminescence ofLUCL and LUCL met1-3. The top panel contains twoLUCL seedlings and the bottom panel contains two LUCLmet1-3 seedlings. (B) RT-PCR of LUC transcriptlevels. UBQ5 was used as an internal control. (C)Bisulfite sequencing analyses of LUCL (blue bars) and LUCLmet1-3 (red bars) reveal that CG methylation is reduced at allfour regions tested in LUCL met1-3. The regions tested areindicated in Figure 2D. RT-PCR: reversetranscription-PCR. CHH methylation is maintained by RdDM involving the small RNA effector AGO4 andthe de novo methyltransferase DRM2. Although the levels of CHHmethylation in LUCL are relatively low (approximately 10% in thed35S promoter) compared to CG methylation, these levels are similarto those of CHH methylation at previously established reporter genes under thecontrol of RdDM. For example, the Superman 5′ region contained15% CHH methylation in the clk-sk line ; the RD29A promoter in an RD29A::LUC line had 6%CHH methylation in the ros1 background in which a DNA demethylase ismutated . Therefore, it is also possible that LUCL is repressed byRdDM. To test this, we crossed LUCL with drm2-6 andago4-6, mutations in DRM2 and AGO4, respectively.These alleles were previously isolated in our lab and found to de-repressLUC expression from LUCH. 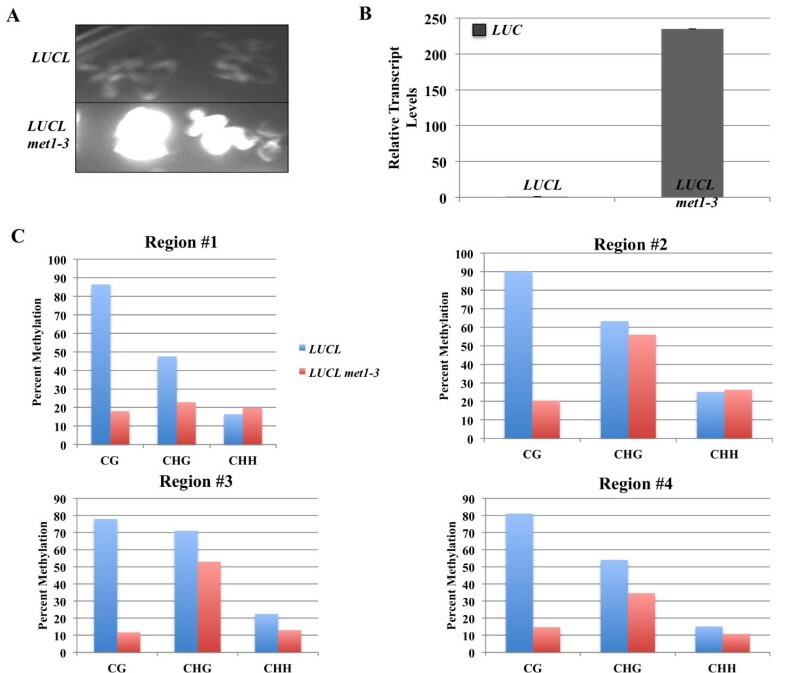 LUCL drm2-6 and LUCL ago4-6 plants had higherlevels of luciferase luminescence than LUCL plants (Figure 4A and 4B). RT-PCR showed thatLUCL drm2-6 and LUCL ago4-6 plants had higher levels ofLUC transcripts (Figure 4C), but theextent of LUC de-repression in drm2-6 or ago4-6 wasmuch lower than that in met1-3 (compare Figure 4C to Figure 3B). We performed bisulfitesequencing in LUCL, LUCL drm2-6 and LUCL ago4-6 todetermine the effects of the drm2 and ago4 mutations on DNAmethylation at the transgene. Little difference in CG or CHG methylation couldbe detected at the d35S promoter or in the LUC coding regionin the two mutants compared to wild type (Figure 2E).For CHH methylation, only the 3′ portion of the LUC coding regionshowed an approximately 50% reduction in the two mutants (Figure 2E). 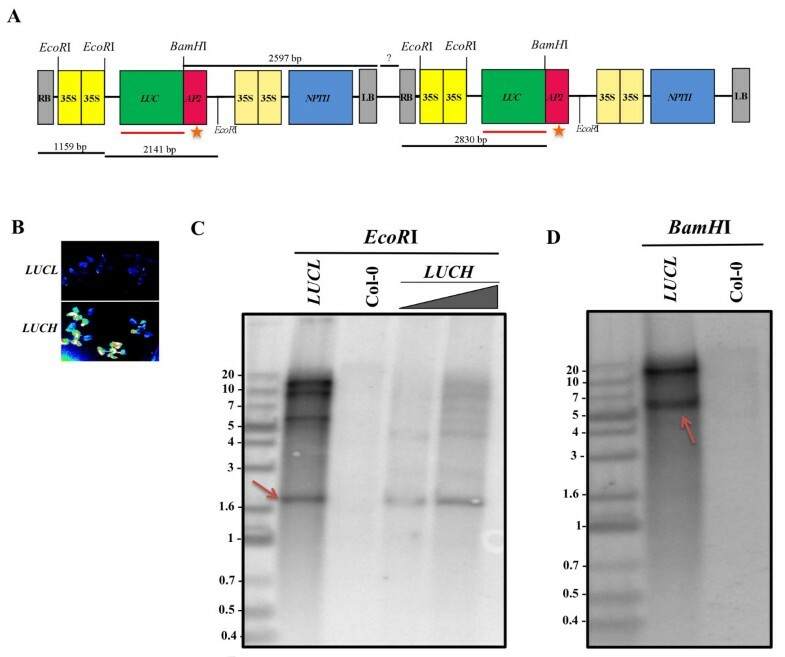 We conclude that LUCL is a sensitive reportersuch that even a small reduction in DNA methylation is reflected by moderatede-repression of the reporter. LUCL is weakly de-repressed by mutationsin DRM2 and AGO4 . (A) Luciferase luminescence of LUCL, LUCH anddrm2-6 LUCL seedlings. (B) Luciferase luminescenceof LUCL, LUCH and LUCL ago4-6 seedlings. (C) RT-PCR of LUC transcript levels inLUCL, LUCL drm2-6 and LUCL ago4-6.UBQ5 was used as an internal control. RT-PCR: reversetranscription-PCR. Since LUCL is silenced by DNA methylation, we reasoned that we could useluciferase luminescence as a readout to identify chemical compounds that affectDNA methylation. We screened 24,970 chemical compounds against LUCLseedlings at the two-leaf stage. One of the hits, methotrexate (MTX), releasedluciferase activity in a dose-dependent manner (Figure 5A, B, C, D). MTX is a compound that inhibits dihydrofolatereductase (DHFR), an enzyme that participates in tetrahydrofolate (THF)synthesis. DHFR catalyzes the conversion of dihydrofolate (DHF) to THF  (Figure 5M). The energy given off by theconversion of THF to 5-methyl THF catalyzes the production of methionine fromhomocysteine and vitamin B12. Therefore, MTX ultimately prevents the productionof the methyl donor, S-adenosyl methionine (SAM)  (Figure 5M). MTX is found in two forms, Dand L (in reference to the molecule’s chirality) (Figure 5K, arrows). While we tried to perform the secondaryvalidations with the compound, we found that the compound pulled from theinitial screen possessed D chirality (Figure 5K,bottom), and the vendor discontinued the product. Thus, we tested LUCLwith L-MTX and a racemic mixture of D- and L-MTX. Both L-MTX and the racemicmixture were able to release luciferase activity of LUCL atconcentrations lower than that of D-MTX (Figure 5E,F, G, H, I, J). L-MTX is more efficiently taken up by human cells than D-MTX ; perhaps this is also true in plants. We tested whether MTX releasedDNA methylation at LUCL by McrBC-PCR. Indeed, we found that D-MTXreleased DNA methylation at the d35S promoter in aconcentration-dependent manner (Figure 5L). MTX releases DNA methylation of LUCL. (A-J)Luciferase luminescence of LUCL seedlings treated with variouscompounds. (A) DMSO-treated LUCL seedlings. (B-D)D-MTX-treated LUCL seedlings. (E-G) LUCL treatedwith a mixture of D- and L-MTX. (H-J) L-MTX-treated LUCLseedlings. The concentrations of the chemicals are as indicated in(B-J). (K) Chemical structures of L-MTX (top) andD-MTX (bottom). The arrows indicate the position of chirality of the twoforms. (L) McrBC-PCR-based methylation assay of LUCLseedlings treated with D-MTX. DC: DMSO-treated Col-0 control, D:DMSO-treated LUCL. The gray triangle represents increasingconcentrations of MTX (2 μM for the left lane and8 μM for the right lane). (M) MTX inhibits SAMbiosynthesis to indirectly affect gene silencing via DNA methylation.MTX inhibits the conversion of DHF to THF. Under normal circumstances,the energy given off by the conversion of THF to 5-methyl THF promotesthe production of methionine from homocysteine and vitamin B12. (N) Expression of LUCL and six endogenous RdDM lociin DMSO (control)- and MTX-treated seedlings as determined by RT-PCR. (O) McrBC-PCR-based methylation assay of LUCLseedlings treated with DMSO (D) or MTX (M), and non-treatednrpe1-11 seedlings (n). Two biological replicates gavesimilar results and only one is shown here. +: McrBC digested; -:non-digested. The six loci in the bottom panel are known to undergoRdDM. LUCp1 to LUCp4 correspond to regions 1 to 4 ofthe LUCL transgene in Figure 2D.Chr2_1882324 is a region that harbors DNA methylation in wild type.At2g19920 is a gene that does not harbor any DNAmethylation and is used as an internal loading control. DHF:dihydrofolate; DMSO: dimethyl sulfoxide; McrBC-PCR: digestion of genomicDNA by McrBC followed by PCR; MTX: methotrexate; RT-PCR: reversetranscription-PCR; SAH: S-adenosylhomocysteine; SAM: S-adenosylmethionine; THF: tetrahydrofolate. Next, we examined whether MTX affects DNA methylation and/or transcriptionalsilencing of endogenous loci. Seedlings were treated with DMSO (control) or aracemic mixture of MTX, and the expression of the luciferase transgene as wellas six endogenous loci known to undergo RdDM was determined by RT-PCR. MTX ledto the de-repression of the luciferase transgene and the six endogenous loci(Figure 5N). The DNA methylation status of thesix loci, as well as Chr2_1882324 (another locus that harbors DNA methylation)and the luciferase transgene, was evaluated by McrBC-PCR. In addition to thed35S promoter, the luciferase coding region showed reduced DNAmethylation in MTX-treated seedlings (Figure 5O). MTXtreatment also led to reduced DNA methylation at the six endogenous loci(Figure 5O). The effect of MTX was similar tothat of the nrpe1 mutation (in the largest subunit of Pol V) in thereduction of DNA methylation at these loci (Figure 5O). We developed a luciferase-based reporter transgene (LUCL) that reports TGSby MET1-mediated CG methylation as well as de novo methylation byRdDM. Like existing TGS reporter systems [2, 39], LUCL is suitable for identifying positive players involved inde novo methylation by RdDM and CG maintenance methylation. The lack ofluciferase luminescence from LUCL allows for facile genetic or chemicalscreens in which mutations or compounds that release DNA methylation could be easilyidentified based on the appearance of luciferase luminescence. Using this reporterline, we have screened approximately 25,000 small molecules and obtained tworeproducible hits. One of these hits, MTX, serves as a proof-of-concept as itsnegative function in methyl biogenesis is known . Another feature of this reporter system is that it harbors high levelsof DNA methylation in the LUC coding region. Thus, LUCL may beused as a probe to dissect the molecular mechanism and function of gene bodymethylation. Arabidopsis mutants used in this study, rdr6-11, dcl1-7, met1-3, drm2-6, ago4-6 and nrpe1-11 [41, 42], are in the Col-0 background. Arabidopsis thaliana seeds were surface-sterilized with 30% bleach,planted on Murashige and Skoog (MS) agar plates containing kanamycin(30 mg/mL for lines containing LUCL) and stratified at 4°Cfor 2 days. Seedlings were grown at 23°C under continuous light for10 days. All experiments with LUCL and LUCH wereperformed with 10-day-old seedlings. For the chemical screen, two seeds wereplated into each well in a 96-well plate. After 7 days, chemicals wereadded in each well, except for the first column, in which DMSO was added as anegative control. Three days later, the plates were imaged for luciferaseactivity . For the secondary screening of MTX, D- and/or L-MTX (Sigma) wereadded individually per well. After images were taken, plants were collected forsubsequent methylation assays. For luciferase live imaging, 1 mM luciferin(Promega) in 0.01% Triton X-100 was sprayed onto the seedlings, which wereincubated in the dark for 5 min before images were taken. Luciferase imageswere taken using a Stanford Photonics Onyx Luminescence Dark Box with a RoperPixis 1024B camera at the UC Riverside Genomics Core Facility. LUCL and LUCH are two independent transgenic lines containingthe same transgene, which has been previously described . Southern blot analysis was performed according to the standardprotocol  to evaluate the copy number of LUCL using the full-lengthLUC coding region as the probe. The probe was amplified withprimers lucp6 and lucp7, and radiolabeled with the RPN1633 Rediprime II randomprime labeling system (GE Healthcare). Primers used were previously describedand are listed in  and Additional file 1: Table S1. For the McrBC-PCR assay, two reactions were set up for each genomic DNA sample:McrBC treated and untreated. Next 400 ng genomic DNA was digested withMcrBC (New England Biolabs) for 30 min at 37°C in a 20 μlreaction. Then 1 μl of restricted genomic DNA was used as the templateand genomic regions corresponding to the LUCL transgene or endogenousloci were amplified. At2g19920 was used as a loading control. SeeAdditional file 1: Table S1 for sequences ofprimers. For bisulfite sequencing, in Figure 2, 1 μgof RNase-treated genomic DNA was subjected to bisulfite conversion using theEpiTect Bisulfite Kit per the manufacturer’s instructions (Qiagen). ForFigure 3, 400 ng of RNase-treated genomicDNA derived from leaf tissue from LUCL and LUCL met1-3 plantswas subjected to bisulfite conversion using the MethylCode™ BisulfiteConversion Kit per the manufacturer’s instructions (Invitrogen). The PCRreactions with primers YZ 35S Bis F and YZ LUC Bis R as well as another threesets of primers that covered the LUC coding region were performed usingthe converted DNA as a template as described previously , purified via gel extraction per the manufacturer’sinstructions (Qiagen or Zymo), and cloned into the pGEM-T Easy vector (Promega).A minimum of 24 clones were sequenced for each sample and unique clones wereanalyzed for DNA methylation with Kismeth [44, 45]. To determine the conversion efficiency, PCR reactions were conductedwith primers specific for chloroplast DNA using the same converted DNA as aboveand the PCR products were processed in the same manner. At least 15 uniqueclones were selected for analysis by Kismeth. As chloroplast DNA isunmethylated, conversion efficiency could be determined. See Additional file1: Table S2 for conversion rates of varioussamples. For 5-aza-2′-deoxycytidine (Sigma) treatment, seeds weregerminated and grown on an MS agar medium containing 1% sucrose and7 μg/mL of the chemical for 2 weeks and luciferase images weretaken. RNA was isolated with Tri-reagent (Molecular Research Center) from 10-day-oldseedlings from LUCL met1-3, LUCL ago4-6 and LUCLdrm2-6 plants as previously described . For the RT-PCR in Figures 3 and 4, older leaf tissue from LUCL met1-3, LUCLago4-6, and LUCL drm2-6 plants was utilized. For the RT-PCR inFigure 5, 10-day-old, chemical-treated seedlingswere used. cDNA was synthesized from 5 μg (14 μg forFigure 5) of DNaseI (Invitrogen)-treated totalRNA using reverse transcriptase (Fermentas) and oligo-dT (Fermentas) aspreviously described . The sequences of primers are listed in Additional file 1: Table S1. Small molecule compounds used for the chemical screen consist of: 1,200 fromLifeSciences, 2,000 from Spectrum and 400 from Myria/Sigma from the UCR smallcompounds collection ; 4,204 from a triazine-tagged library [48, 49]; 2,768 from Clickables  and 3,580 from LATCA . The screening was performed at the Chemical Screening Facilities atUC Riverside. The work was supported by a grant from the National Science Foundation(MCB-1021465) and by Howard Hughes Medical Institute and Gordon and Betty MooreFoundation (through Grant GBMF3046) to XC. TTD was supported by a NationalScience Foundation ChemGen IGERT program (DGE0504249). TTD and XC wrote the manuscript. TTD designed the chemical screen and performedgenetic analyses of LUCL, Southern blot analyses, bisulfite sequencinganalyses, luciferase imaging, RT-PCR and McrBC analysis. TTD and MOL performed thechemical screen. MOL performed the luciferase imaging for the MTX-treated seedlings.SYW did the 5-aza-2′-dC treatment and RT-PCR of treated seedlings. XL, TTD andLA generated the LUCL met1-3, LUCL ago4-6 and LUCL drm2-6genotypes and analyzed them. SL performed the McrBC analysis on LUCH andLUCL. AD and SRC provided chemicals, performed small moleculeperturbations and offered intellectual assistance with regards to the chemicalscreen. BZ transformed LUCL into rdr6-11. XC constructed thereporter plasmid, conceived and guided the project. All authors read and approvedthe final manuscript.